Who Can Afford McCain’s Surgery? Arizona Republican Sen. John McCain is currently recovering at home from a supraorbital craniotomy performed at the Mayo Clinic Hospital in Phoenix on Friday to remove a two-inch blood clot in his brain. With insurance, the average cost of his surgery is estimated to be anywhere from fully covered to $5,000, depending on the patient’s income and the annual deductible of the insurance plan. 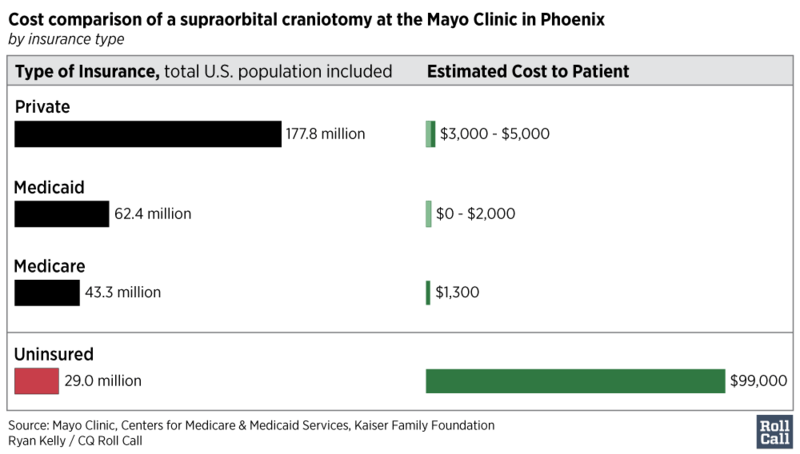 Without insurance, the surgery would cost the patient around $100,000. An estimated 29 million American residents are currently uninsured, 845,000 of whom live in Arizona. The Congressional Budget Office had projected that an additional 22 million Americans would lose their health insurance over the next decade under the Senate Republicans’ initial health care legislation. The release of a new CBO estimate of the Senate GOP’s latest draft has been postponed indefinitely.